We all thought it was over. With the release of 13 in 2013, Black Sabbath fans braced themselves for the last recorded chapter in the band's long and groundbreaking career. (After all, why else would they close the Standard Edition of the album with the sound of rain and thunder – the same thing they used to open their debut album in 1970?). And with a much-discussed feud between the group and estranged original drummer Bill Ward preventing him from being a part of the final run, there was little hope of anything truly Black Sabbath hitting our ears ever again. (While many fans loved 13, the thing left me cold, which I made clear in my review shortly after the album's release.) 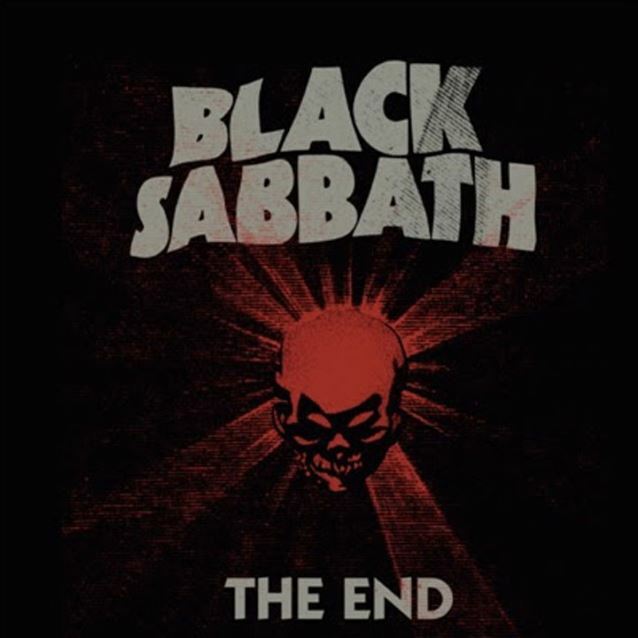 But the 2015 announcement of (supposedly) one last tour was later accompanied by an intriguing addendum – the release of a new Black Sabbath CD called The End. At the time of this writing, every second of The End that showed up on YouTube over this past weekend has already been removed, while copies of the disc are already appearing on eBay at ludicrously high prices. These factors, combined with the CD's $30 price tag at shows, have led more than a few longtime fans to give up on experiencing The End. While the reluctance to embrace this release is understandable, it is also a critical mistake for any follower of the world's greatest Metal band to make. No mere collection of cash-grabbing filler, The End has more to offer than many might realize. First of all, let's address the four studio tracks. Although they were apparently culled from the same sessions that spawned 13, this writer's hand is firmly on his heart when he states that these songs blow away everything on that album. (And that includes the four bonus tracks that were spread over different incarnations of the album, save for maybe the still-blistering "Naïveté in Black" that appeared on the Best Buy edition.) The mid-tempo march that opens “Season Of The Dead” gives way to a classic vocal performance by Ozzy Osbourne and the same high level of fluid musicianship that defined Sabbath's original era (especially with the 80 Technical Ecstasyesque seconds that begin at the 3:17 point). There are moments on “Season Of The Dead” where the Sabs explore their deepest grooves since the '70s, and the Ozzman is right there with them. This is a brilliant number made even more fascinating by the fact that it was somehow excluded from 13. This is the Sabbath we know and love. Fueled by Sabbath's incomparable slow crunch, “Take Me Home” showcases one of Iommi's greatest moments in his nearly 50 years with the band. Offering a beautiful acoustic guitar solo that echoes the majesty of 1972's “Laguna Sunrise,” he gives us all a powerful reminder of why he will forever be the undisputed king of Metal guitar. The man doesn't need distortion to be powerful; the sounds he makes are from the soul. Although “Isolated Man” sounds much closer to a latter-day Ozzy solo track than a traditional Sabbath tune, the sucker packs a punch thanks to some stellar interplay between Geezer Butler and 13 studio drummer Brad Wilk (Rage Against The Machine/Audioslave) during Iommi's solo. Controversy aside, Wilk's work on this song alone demonstrates why he was the best second-best drummer for the job. As for the live tracks...If you've seen or heard Sabbath live in the last few years, you know what to expect (for better or worse), although the inclusion of “Under The Sun” is a nice touch. And live drummer Tommy Clufetos (Ozzy/Rob Zombie) does an adequate job behind the kit, even if his workmanlike performance is often bereft of Ward's endearingly sloppy swing. So why does The End work for me when 13 didn't? I'm not entirely sure, to be honest. Perhaps I'm listening to this without the incredibly high expectations I had for 13. Perhaps I've accepted that the final version of the “classic” Black Sabbath is a trio and not a quartet. Perhaps I'm giving this a more-than-fair shake because this is really really (probably) the end this time. (Considering their advanced ages and Iommi's overall health, how much longer can this band really last?) Or perhaps the studio tracks on this thing really are better than 13. (I re-listened to that album before writing this review. I'm still not into it.) Whatever the reason, The End feels like real Black Sabbath to me. If this is indeed the last time we'll be able to experience a Black Sabbath release with new music, then the fellas are saying goodbye on a surprisingly high note.